The other day a friend on Facebook asked me about the differences between living in California and Oregon. My response was basically that the states are so large and so diverse that it’s tough to do an accurate assessment of state vs state but city vs city would probably be a bit more appropriate. Within the thread a friend and colleague of mine Kristin Thompson mentioned a very cool site called “Find Your Spot“. The site simply asks you a few questions about your ideal living environment and then goes to work with it’s custom algorithm to determine the places that you’d most likely be happy living. So, I went through the process which took about 5 minutes and here are the top 5 results it spewed out for me. Wow Southern Girl. What’s up with that? I just typed out the rest of my results to give to Otto, so I figured I’d just post the whole list here. Hehe… I knew the west coast wasn’t for me. I wish Otto liked the east! OK. I feel crazy for posting again, hehe, but I took the test one more time and got results that seem more in line with me. Wow, that’s such a lengthy and diverse mix. There are some places on there I’d like to visit but not sure about living such as Nashville and North Carolina. Why it recommended El Paso is beyond me. I can’t imagine wishing that upon anybody. I haven’t taken it in a while, but Portland Or was #1 for me and my hubby- that how we ended up here– all thanks to Find Your Spot. 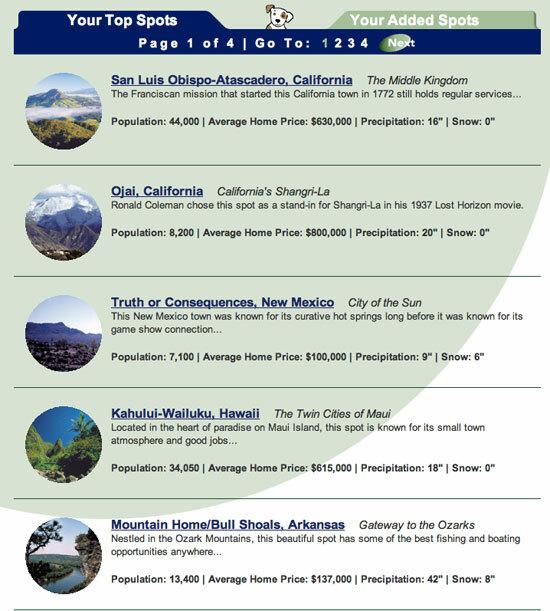 Also on our list was Santa Cruz, Santa Barbara, Albuquerque, Austin, and a bunch of others I can’t recall anymore. Its a super fun site for sure. Looking at moving, but none of these are even on the list .. guess I should read the rest of the list and see if what I am looking at even makes it. I live in Morgantown WV and love it there just fine! Lets just say small town USA is the perfect spot for me. Either the North West or North east.